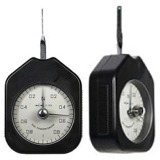 Force meters for laboratories, for measuring in situ and for educational purposes are available on the website. Force meters are accurate to ±0.3% of the load and have a range of 20% of the surface weight and provide measurements in grams (g) and Newton (N). The force meters with a surface weight of 5 to 1000gr have a clamp as a load support, and those of 2.5 to 50kg have a hook and most devices up to 100 t, a carabineer. Measuring with a compression kit available on the web can convert a traction meter, with a simple change, into a compression meter. Together, with mechanical force meters, we also offer digital force meters. A lot of our force meters possess an internal storage to guarantee that all your measuring results can be stored. In addition to that, some are equipped with an RS-232 interface and require an optional software pack to allow for data to be transferred to a computer for analysis. 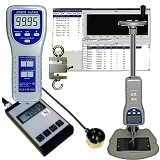 Mechanical force meters are applicable for educational purposes. It is very useful to have force meters in class when it comes to the topic of force in physics lessons. The larger models come equipped with a segmented indicator and a drag needle. Digital force meters are primarily used in research and development. If you cannot find the force meters you are looking for, feel free to contact us. Our technicians and engineers are available to assess your needs and recommend the best suited force meter and any of our other products. Simply call our offices on: UK customers +44(0) 23 809 870 30 / US customers (561) 320-9162. Our engineers and technicians will be happy to help you with our measuring instruments and of course, with the other products in the field of regulation and control, and scales and balances. What is the mean of Force? In physics, force is a physical quantity that measures the intensity of the exchange of momentum between two particles or particle systems (in the language of particle physics this is called interaction). According to a classical definition, force is any agent capable of modifying the amount of motion or the shape of material bodies. This should not be confused with the concepts of effort or energy. Tension is the name given to the internal strength put on a body by applying two forces that pull in opposite directions and stretch it. Logically, the tension of any section that is perpendicular to these forces is normal to that section, and they have the opposite effect to the forces trying to stretch the body. In the case of solids, the deformation can be permanent; in which case, the body has exceeded its yield point and behaves like a plastic, in that after the traction force stops, it remains stretched; if the deformation is not permanent, the body is said to be elastic, so that when the traction force disappears, it recovers its original length. The relationship between the tensile force that occurs and the deformation that is produced is usually represented graphically by means of a Cartesian axis diagram that illustrates the process and offers information on the behaviour of the body in question. Compression is the result of tensions or pressures that exist within a deformable or half continuous solid, characterized because it tends to have a reduction in body volume and is the body shortened in a determined direction. In general, when a material is subjected to a set of forces, so much flexion is produced, such as shearing or twisting, all these forces bring about the appearance of tensions, both traction and compression. However, in engineering there is a distinction between compression force (axial) and compression tension. In a mechanical prism the compression force can simply be the resulting force that pulls on a determined section that is transversal to the barycentric axis of said prism, which has the effect of shortening the piece in the direction of the barycentric axis. Prismatic pieces subjected to a considerable compression force are susceptible to experience flexional buckling so for proper sizing it is necessary to examine this type of non-lineal geometry. Apart from measuring maximum force of a tear or a break, with the hel p of force meters, it can determine the temporal discourse of force. To do this, an optional software pack is required and the LTS-20 manual test position. To the right you can see a photograph showing the combination of these devices. The PCE-FM series of force meters can determine many measurement values, but the software is able to transfer this data, one value every 2 seconds. If a higher transfer rate is required, Windows hyper terminal can be used. Call our offices on: UK customers +44(0) 23 809 870 30 / US customers (561) 320-9162. If you have any questions regarding the software or transferring data to a computer. The following link has information about: Calibration certificates for force meters. in Polish in Bulgaria in Russian in Turkish in Czech Republic and in Portuguese.